Our range of products include poultry feed plant, fish feed plant and cattle feed plant. We are the supplier and exporter of excellent range of Poultry Feed Plant. The offered machines are highly acknowledged for their power efficiency and are characterized by a sturdy construction. Customers can avail these machines from us at standard market prices. These machines find vast application in the agricultural processing industry and are highly regarded for their optimal performance. 150KG-200KG/Hour With 3HP Crompton motor 440 volt and all complete stander accessories. “GRINDING MACHINE” (Disintegrated type) with MS stricter long term working power .Rounding jail lock type easy process opening system . Capacity 150-200KG/Hour With 10HP Crompton motor 440 volt and all complete stander accessories. Best India make heavy duty, Export quality “Automatic Cutting/Fish feed pellet machine” fitted on stand is very strong &sturdy used for making cutting feed of various sizes of thick or thin by changing only the perforated dies Capacity 100 kg -150Kg per hour with all stander accessories. With POWER- 30 HP MOTOR. Production Capacity (3mm Jali) 250kg to 350kg/ MS feeding hopper, Hammering blade place made by M.S materials. Blower Pipe line and cloth. Long time working capacity no maintenance, Two bearing with 15 HP Crompton motor, & Vibrate control channel and rubber pad, pulley ,belt, with all complete standard accessories. POWER- 15 HP Motor (11.25 KW) 1440 RPM 440 volt. Best India make heavy duty, Export quality “AUTOMATIC MIXER MACHINE” 304 SS body long term working power with gearbox of capacity 50 kg per batch ,with 3 HP motor Crompton 440V coupling, belt with all stander accessories. 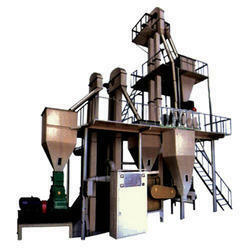 Small Cattle Feed plant are used to manufacture Cattle Feed such as feed for Buffalo, Cow's, Bulls etc. 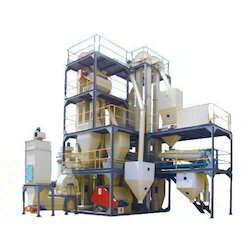 Main machinery use for this purpose conveyors, grinders, mixer machine, cooler, sieve. 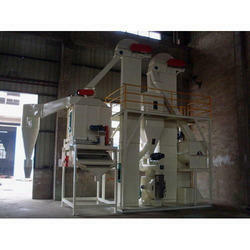 This range of quality Cattle Feed Machinery features minimum energy consumption and high capacity. The modular structure of the plant is compact and it requires less investment in civil works. In addition to this, the modular structure is containerized and it assures convenient assembly and dismantle of the machinery. “GRINDING MACHINE” (Disintegrated type) with MS stricter long term working power .Rounding jail lock type easy process opening system. With10HP Crompton motor 440 volt and all complete stander accessories. POWER- 10HP (7.5) 440Volt. Best India make heavy duty, Export quality “MIXER MACHINE” Drum size 100 kg. Batch time 10-15 minutes, 3HP motor Crompton and coupling, belt, pulley with all stander accessories. Best India make heavy duty, Export quality “SCREW CONVEYER” Frequency conversion speed adjustable with all stander accessories. Power2.2 kw. Best India make heavy duty, Export quality “PELLET MILL” Capacity 200-300KG/H With 10HP motor with all stander accessories.power-7.5kw.